A playroom on the fifth floor of the University of Maryland Children’s Hospital is stocked with books, action figures, toy trucks, and games. In the corner of the room also sits a miniature MRI machine with a small doll lying flat on its back; a toy stethoscope and other child-sized medical equipment hangs in a bag nearby. 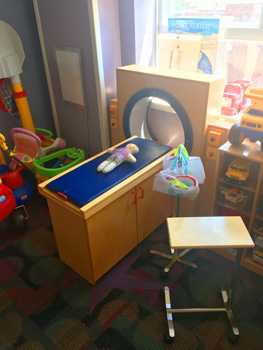 The playroom is warm and welcoming, providing a space for children to see and touch medical tools that are similar to the equipment they see in the hospital. An overnight stay for a child can be a scary and emotional experience. 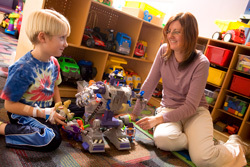 These medical toys allow a child to play through their hospital experience and help child life specialists to support a child’s understanding of this experience. The toys are available thanks to the Child Life Fund, which supports the needs of children who are patients at the University of Maryland Children’s Hospital. Play is just one portion of the services provided through the fund. The Child Life Fund also supports holiday celebrations, like the annual Snow Pile toy shop for families, birthday celebrations, special procedural preparation teaching tools, and arts and crafts supplies. The fund covered the installation of interactive games and activity boards lining the walls of some hallways, as well as a room for older children and teenagers to watch movies and play video games. If a child wants to watch a movie and is unable to leave his or her patient room, a portable DVD player can be brought to them. The Child Life Fund also serves siblings, who may need help understanding and processing the circumstances surrounding their sick brother or sister. Services and support groups are available to parents as well, including a ‘coffee hour’ that connects parents with other parents in a similar situation. If a child passes away, the Child Life Fund enables the health care team to provide grief resources and legacy items for the family, such as handprint impression kits and locks of hair. To support the essential services of the Child Life Fund, consider making a donation. Your gift will help comfort many families in their time of need.